Gulf of Poets and Cinque Terre hikes to enjoy spectacular views far from the mass circuits. 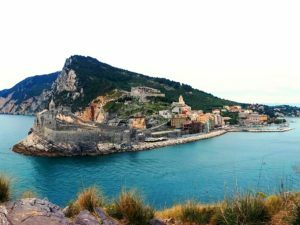 Three Parks of exceptional beauty in a very short distance: Cinque Terre National Park, Portovenere Regional Park and Montemarcello Regional Park, in addition to other natural protected areas, make this corner of the Italian Riviera a real paradise for hiking lovers. From the picturesque village of Tellaro in the Gulf of Poets as far as Levanto you can enjoy one of the most beautiful coasts of the Mediterrenean, featuring small inlets and coves with multicolor rocks and deep blue sea, quaint villages hanging from the cliff surrounded by terraced vineyards. A fragile territory difficult to live in and cultivate that has been shaped by man over the centuries and today by a new tourism economy. The Parks offer various hiking opportunities for one or more days suspended between mountains and sea. The area is also connected with other trekking trails such as Alta Via dei Monti Liguri, Alta Via dei Santuari, Alta Via del golfo, Sentiero Liguria. We offer day or multi-day hikes and treks along the classic coastal circuits of the Cinque terre but also off-the-beaten path itineraries in the National Park and in the Gulf of Poets, to explore these beautiful places slow, far from the crowd and with attention to the local culture and traditions. Contact us for more info and tailormade itineraries for individuals and small groups.